As a composer Diepenbrock was especially inspired by the mystical tone of Novalis’ Hymnen an die Nacht (Hymns to the Night). The series of songs on texts from this collection starts with Hinüber wall’ ich (I Pilgrimage over There, RC 37) from 1897, and reaches a highpoint two years later with Hymnen an die Nacht for voice and orchestra (RC 49 and RC 50). 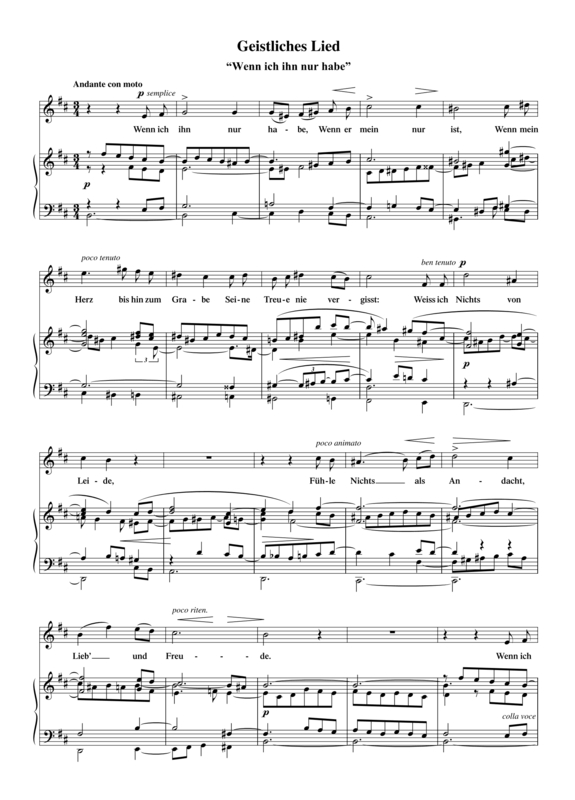 Preceding the Hymnen an die Nacht, Diepenbrock wrote two compositions for soprano and organ on texts from Novalis’ Geistliche Lieder (Sacred Songs), which in the nineteenth century was a very popular collection. The set of poems, which were written in 1799 and 1800 and published posthumously, were intended as food for thought for the Protestant congregation. With these mystical but overall easy hymns, Novalis hoped to contribute to the depth of the congregation’s personal faith. This registration as it were points towards the orchestration Diepenbrock would make of this song in 1906 (see RC 72). The composition closely follows the structure of the simple poem, which has identical openings for each strophe. The unaffected melody of the voice (semplice) is mostly syllabic. 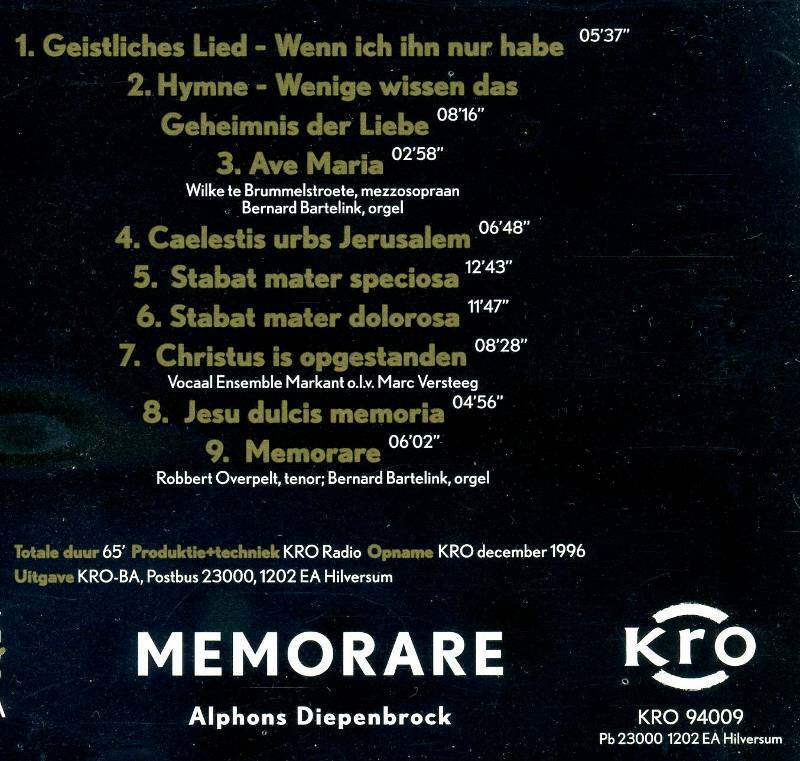 An exception to this is the exuberant melisma at the end of the third verse (on “durchdringen” – penetrate). Several times the easy-going motion (Andante con moto) in 3/4 time is interrupted by a change of measure for the sake of prosody. Wenn ich ihn nur habe is in b minor, but in the last verse (opening with the words “Wo ich ihn nur habe, ist mein Vaterland”) Diepenbrock permanently switches to major, which was already latent before. At the beginning of 1899 Diepenbrock intended to send both Geistliche Lieder to his friend Charles Smulders in order to gauge his opinion. However, by then he had become engrossed in his work on the Hymne an die Nacht for soprano and orchestra. From the fact that on 3 October of that same year Diepenbrock asked Smulders to return the manuscript of the songs to him for a rehearsal with the singer and organist, we can deduce that Smulders took the Geistliche Lieder with him after visiting Amsterdam for several days in April to attend two concerts with compositions of his own. Fühle nichts als Andacht, Lieb’ und Freude. Breite, lichte, volle Straßen wandern. Alles wird erweichen und durchdringen. Der der Jungfrau Schleier hält. Kann mir vor dem Irdischen nicht grauen. Wie ein Erbteil in die Hand. Find’ ich nun in seinen Jüngern wieder. 14 nov 1899: Eerste uitvoering van het Geistliches Lied (“Wenn ich ihn nur habe”) in de St. Pieterskerk te Utrecht door Aaltje Noordewier-Reddingius met orgelbegeleiding van W. Petri. Der Sänger geht auf rauhen Pfaden, Zerreisst in Dornen sein Gewand.